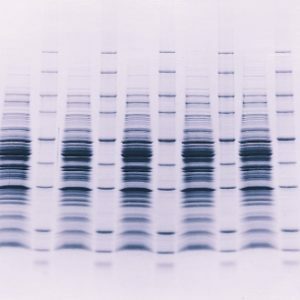 Laemmli sample buffer (1X) is especially formulated for protein sample preparation to be used in the Laemmli SDS-PAGE system. A protein sample is mixed with the 1X sample buffer (1:1) and heated in a boiling water for 2-5 min.The 2-mercaptoethanol contained in the buffer reduces the disulfide bonds and the SDS detergent denatures the proteins giving each an overall negative charge so that they can be separated on a polyacrylamide gel based on size. The bromophenol blue serves as a dye front that runs ahead of the proteins and also serves to indicate the sample during loading. Glycerol increases the density of the sample so that it will layer in the sample well. 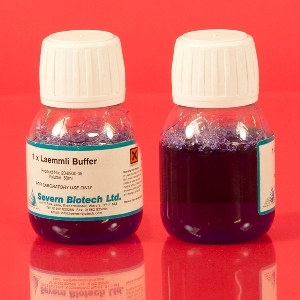 Laemmli buffer contains 4% SDS, 20% glycerol, 10% 2-mercaptoethanol, 0.004% bromphenol blue and 0.125 M Tris HCl (pH approx. 6.8). Recommended usage: add 1 volume gel loading solution to 1 volume sample and mix well.